My homemade sticky buns are some of the best I’ve ever eaten. They’re just so addicting!!! I tested this recipe a whopping 5 times to make sure I got every-single-element just right. And now that I have, I’m so excited to share it with you. This recipe really isn’t too tricky, but you’re going to need to plan ahead, pay attention to the steps, and make sure you have plenty of time. I also highly encourage you to fully read through the ingredient list and instructions at least once before beginning this recipe. The sticky bun dough is made with flour, yeast, sugar, salt, milk, water, egg, butter, vanilla, and a pinch of nutmeg. Simple ingredients! You will bring the dough together in a stand mixer fitted with the dough hook. This will take about 10 minutes, but luckily the mixer does most of the work for you. The dough will be sticky, smooth, and shiny. You’ll want to lightly oil a large bowl, transfer the dough into it, cover it tightly with saran wrap, and set it in a warm place for two hours. The dough will rise a lot during this time! While the dough is rising, make your caramel sauce. The sauce is made from butter, brown sugar, vanilla, and cream. You’ll boil these ingredients together for 5-6 minutes, then pour the sauce into the bottom of a 9×13 inch baking pan. For best results, I recommend using a candy thermometer . The filling is made from melted butter, brown sugar, granulated sugar, and cinnamon. You’ll combine the sugars and cinnamon in a small bowl, brush the melted butter over the rolled out dough, then sprinkle on the cinnamon sugar mixture evenly on top. At this point you’ll tightly roll the dough up (jelly roll style) and slice it into 12 slices. For the frosting you’ll need cream cheese, vanilla, cream, salt, and confectioners sugar. You’ll want your cream cheese very, very soft. After you beat the cream cheese smooth, you add in the vanilla, cream, salt, and sugar and beat until fluffy. If you want step-by-step photos to assist you visually, check out this post. When you pull the buns out of the oven you’re going to need some self control. The buns must (must must must) cool in the pan for 10 minutes before you invert them from the pan onto a large platter. The caramel sauce will be dangerously hot so be careful during this step. Make sure you only cool the buns in the pan for 10 minutes. Any longer and the caramel will begin to stick, making it very difficult to remove the buns. The smell that fills your home while these buns are baking is utterly intoxicating. Seriously, you’ll think you’re inside a bakery. To make them extra delish add toasted pecans and more salted caramel sauce. Delicious, decadent, and damn good with a strong cup of coffee. Have a happy weekend! Homemade sticky buns topped with cream cheese frosting and salted caramel. Lightly grease a large bowl with oil; set aside. In the bowl of a stand mixer fitted with the dough hook attachment, combine the flour, sugar, yeast, salt, and nutmeg; mix on low speed for 1-2 minutes, or until thoroughly combined. Keeping the mixer speed on low, add in the egg, milk, water, vanilla, and butter; beat for 3-4 minutes, or until the dough begins to form a ball around the hook. Increase the speed to medium and continue beating for 8 minutes, or until the dough is smooth and shiny. Transfer the dough into the prepared large bowl, turning it once to lightly coat it in oil. Cover the bowl with saran wrap and set aside in a warm place for 2 hours, or until it doubles in size. In a medium-sized saucepan combine the butter, sugar, honey, and cream; bring to a simmer over medium-heat, stirring almost constantly until the butter is completely melted and the sugar is dissolved. Increase the temperature to medium-high and boil, stirring occasionally, until the mixture reaches 230 degrees (F). Remove from heat and pour the caramel into the bottom of a 9x13 inch baking pan. Set aside. In small bowl combine the granulated sugar, brown sugar, and cinnamon; mix well to combine and set aside. Lightly punch down the risen dough and transfer it to a generously floured work surface. Lightly dust the top of the dough with a little flour, then, using a lightly floured rolling pin, roll the dough out into an 18x10 inch rectangle. Brush the melted butter evenly over the dough, then sprinkle cinnamon sugar mixture over the dough. Starting with the long side closest to you, roll the dough up like a jelly roll, keeping it as tight as possible. Lightly pinch the seam to seal the dough and turn the dough so it's seam side down. Using a piece of plain dental floss or a sharp knife, cut the roll into 12 equal pieces. 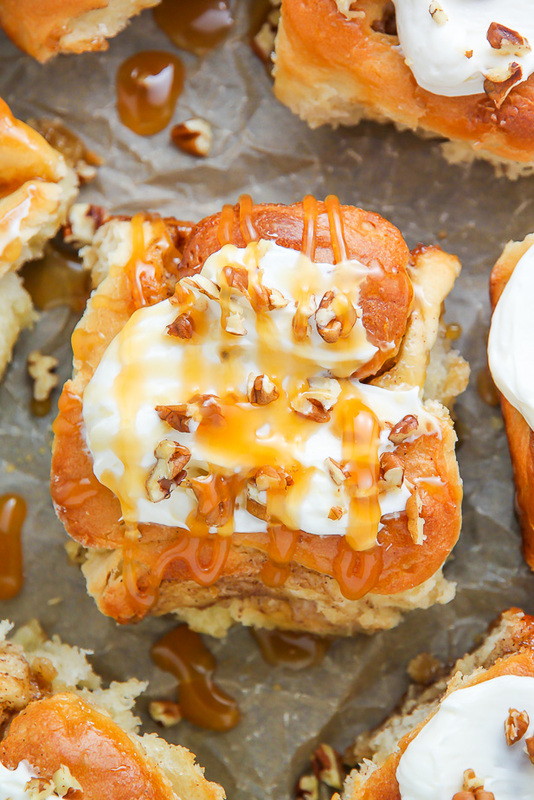 Arrange the buns in the salted caramel sauce coated baking pan, placing them in four rows of three. Cover the baking dish with saran wrap and set aside in a warm area for 1 hour, or until the buns have doubled in size. 30 minutes before baking, preheat the oven to 375 degrees (F). Remove saran wrap and place pan in the preheated oven. Bake for 25-30 minutes, or until the buns are golden brown and the caramel is bubbling, rotating the dish halfway through to ensure even baking. Remove the pan from the oven and let the buns cool in the pan for 10 minutes. After 10 minutes invert the baking dish onto a large serving platter, unmolding the buns with the salted caramel side up. Cool for another 10 minutes. In the bowl of a stand mixer fitted with the paddle attachment, beat the cream cheese on medium-speed until smooth. Add in the vanilla, cream, sugar, and salt; beat smooth until all of the ingredients are fully incorporated. 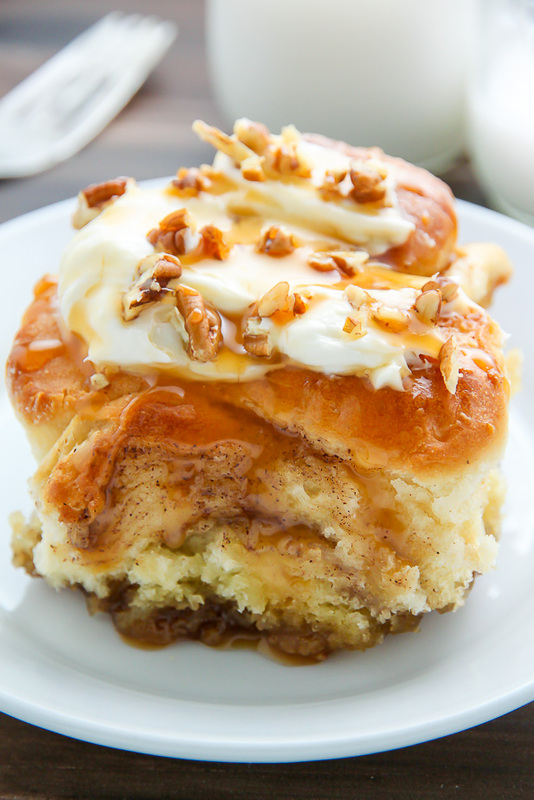 Spread the icing on top of the warm buns, top with toasted pecans and extra caramel sauce, if using, and serve warm. 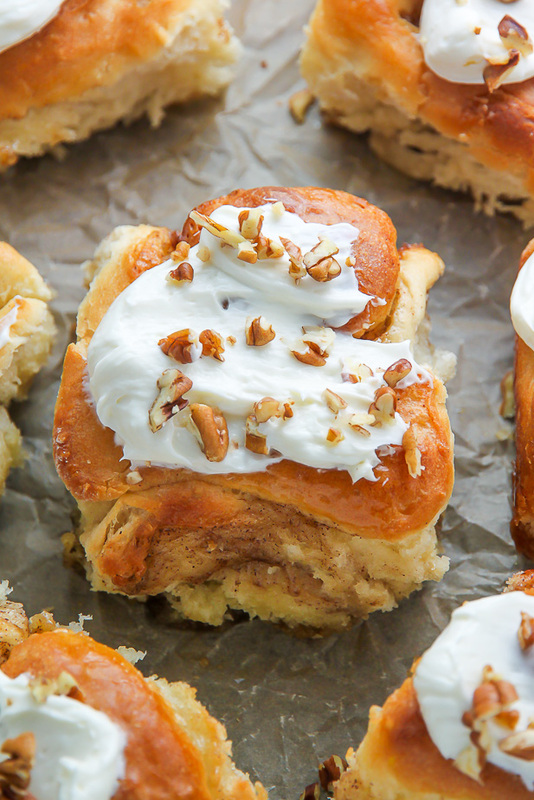 These buns look so so so good! Super yummy! Oh my goodness, what gorgeous pictures of these. 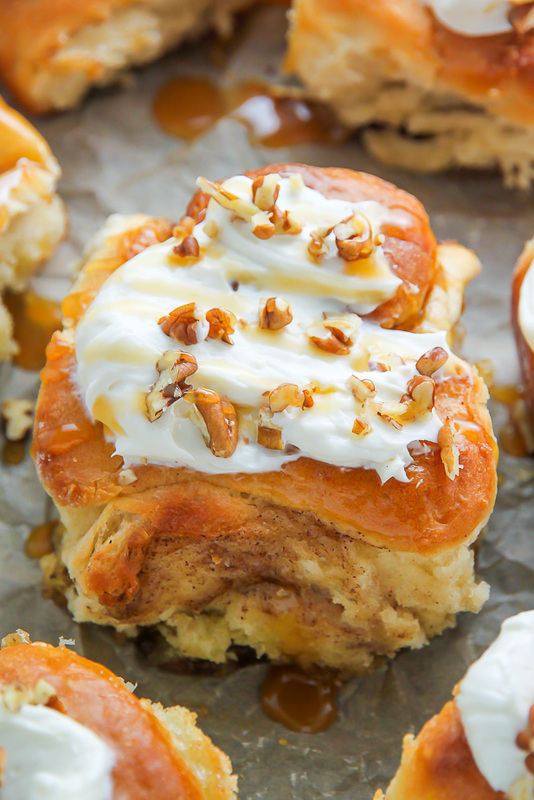 I HAVE to make these sticky buns! I have a ton of pecans from my tree, that I need to open. Because I don’t live where pecan trees usually grow, they are quite small and it’s challenging and slow to extract the meats, but I’m sure this recipe will be worth every minute it takes! I’ll keep you posted! Wow, shelling pecans sounds challenging but fun! Keep me updated and please let me know if you have any questions, Darillyn! Ashley these actually look to die for! It has taken me forever to create fluffy scrolls and these look even fluffier than mine! 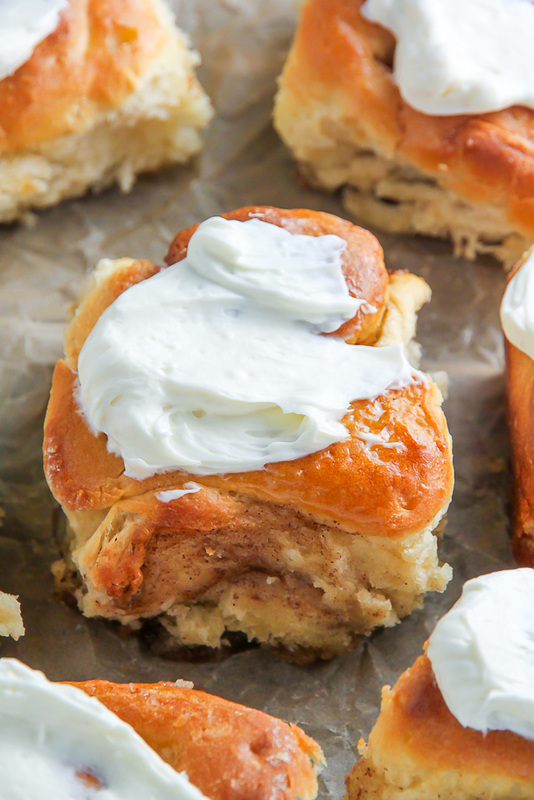 Congrats on baking the fluffiest scrolls I’ve ever seen. I’ll be baking these VERY soon. Thank you, Payton! 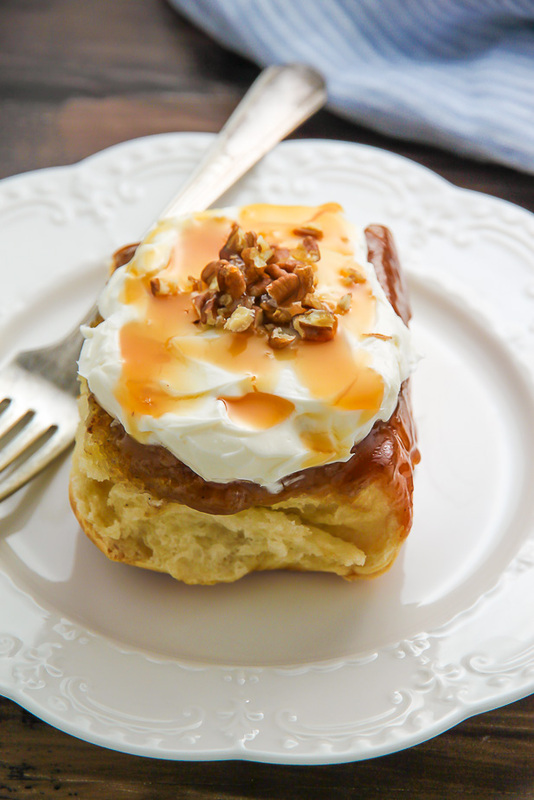 I love fluffy sticky buns, and this recipe does not disappoint 😉 Hope you enjoy! Hey would you mind stating which blog platform you’re using? I’m planning to start my own blog soon but I’m having a tough time deciding between BlogEngine/Wordpress/B2evolution and Drupal. The reason I ask is because your layout seems different then most blogs and I’m looking for something unique. P.S Sorry for being off-topic but I had to ask! Hi Ines. I use wordpress. Good luck! these look amazing, but i have a question – when do you add the sea salt to the caramel sauce? or do you reserve it as a topping? 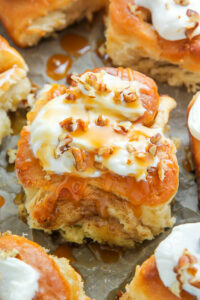 I just made these tonight and the buns are wonderful, with the exception of the caramel sauce. It tastes just like honey. When I was making the sauce, I was honestly confused by the honey because I have never seen caramel made that way. Was that ingredient a mistake? The comments before the recipe only mention the butter, brown sugar, vanilla and cream. I made a triple batch of these for breakfast for a bunch of burly men and they loved them. I did omit the drizzle as the buns had to travel for an hour after they were out fo the oven but it certainly didn’t affect the reception they got. The icing is easy and soooo good and, frankly, enough if you have to ‘make and take.’ Wonderful, easy, relatively quick as I let them rise overnight in the fridge after I formed them and baked them off in the morning. Great success! Thank you. Omg!!! These look to die for…so scrumptious! I’m definitely going to be making these since spring break just started what better time than to bake new recipes…thanks!! !